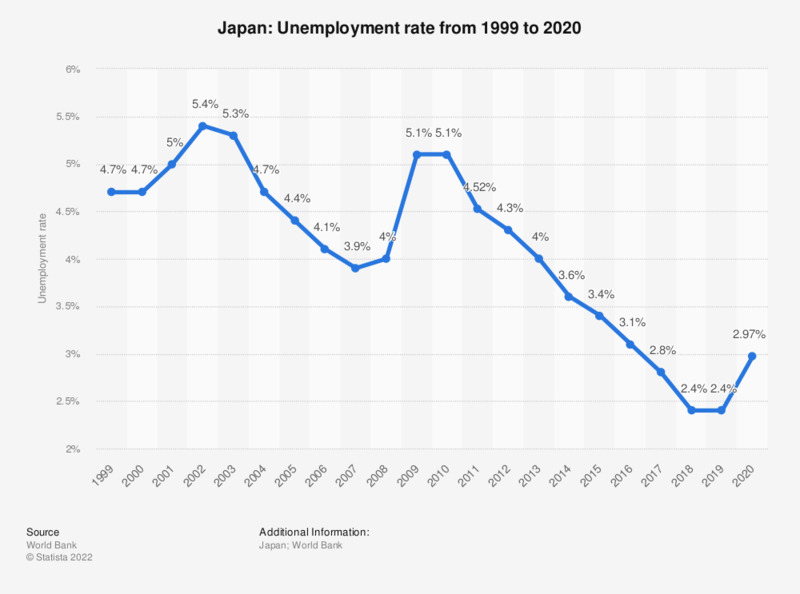 The statistic shows the unemployment rate in Japan from 2008 to 2018. In 2018, the unemployment rate in Japan was at about 2.44 percent. Japan is one of the leading countries when it comes to economic key factors; its unemployment rate, for example, is lower than that of other major industrial and emerging countries. The Japanese work ethic is well-known worldwide, it is synonymous with a strong devotion to the company and to the task at hand; competition among co-workers and loyalty to the company are common and encouraged, working hours and over-time work are said to be excessive. The Japanese language even has its own term for sudden death from being overworked – “Karoshi”. After the devastating effects of World War II, Japan managed to recover economically and even earn a prominent role among other leading economic powers – a fact which is probably partly due to this attitude towards work and employment. Today, Japan is among the leading import countries worldwide, as well as the leading export countries worldwide. Additionally, Japan is one of the 20 countries with the largest proportion of the global domestic product, and also among the 20 countries with the largest gross domestic product per capita, even though it is also ranked tenth among the leading countries with the largest population. Everything On "Suicide in Japan" in One Document: Edited and Divided into Handy Chapters. Including Detailed References.